Yesterday I posted my opinion on separation of church and state in the United States. My opinion was that there is no such thing. The Constitution does not use that phrase and the framers of the Constitution did not intend that their document be used to eliminate religious icons from public lands. The entire notion was invented by left-leaning judges in the late 20th century, who started a campaign to destroy priceless war memorials and other historic objects throughout the country. A state named after the Virgin Mary. That would have to go. Cities named after The Body of Christ, Angels, the Sacraments, the Apostles, the Church Fathers, founders of religious orders, theological concepts, and so forth. Thousands of streets, parks, and neighborhoods throughout the United States have religious names. 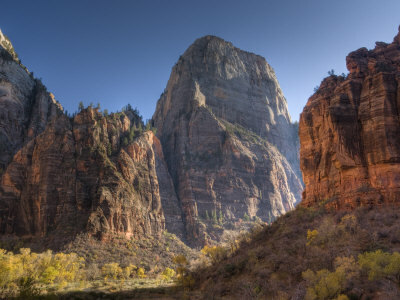 We have a National Park named Zion National Park. Clearly we’ll have to rename it to something non-religious such as “Nietzsche National Park”. To make matters worse, within Zion there’s a natural formation called “The Great White Throne”, which is obviously a Bible reference. I assume this will be dynamited to ensure proper separation of church and state. We will have to sever ties with El Salvador and the Dominican Republic until they choose less discriminatory names. We recently erected a monument to a Baptist Preacher on the Mall in Washington. That will have to be taken down. No far from the MLK monument is a monument to Thomas Jefferson. That may not seem like a problem, since many people believe that Jefferson was indifferent to or even hostile to religion. But just consider what horrible things he wrote in the Virginia Statute of Religious Freedom: “Whereas, Almighty God hath created the mind free; That all attempts to influence it by temporal punishments or burthens, or by civil incapacitations tend only to beget habits of hypocrisy and meanness, and therefore are a departure from the plan of the holy author of our religion, …” Obviously we can’t have a government-funded monument to man who wrote things like that. And lastly, since the horrible Mr. Jefferson also referred to a “creator” when writing the Declaration of Independence, that document will have to be burned. Its effects will be immediately annulled, and the United States will revert to being British colonies. Two stories relating to free expression have to reached my ears lately. One deals with a war memorial on private land, built with private money, that an atheist group is demanding be destroyed. The other deals with deals with a copy of a non-sectarian school prayer in a public high school in Rhode Island, which a judge has ordered destroyed. Cases like these tend to draw out high emotions from both those in favor of destruction and those against it. This blog post, for example, refers to the student who demanded the destruction of the prayer banner as a “heroine”. I, on the other hand, think that demanding the federal government move in to shut down other people’s speech and expression is hardly heroic. Here’s how I see the issues. People who advocate this type of censorship base their case on the Constitutional principle of separation of church and state”. They are absolutely certain that the U.S. Constitution requires separation of church and state. Based on this, they say that any religious item, even something as minor and harmless such as a statue at a war memorial, must be destroyed if it’s on government property. I am absolutely certain that the Constitution does not require “separation of church and state”, and that the phrase does not even appear in the Constitution. In fact, the words “separation” and “church” don’t appear in the Constitution, while “state” is used only when outlining the states as distinct entities, not part of the federal government. Consequently, I’m not convinced by the argument that the Constitution demands separation of church and state. Advocates of censorship also sometimes claim that the First Amendment prohibits government from spending money on anything religious, or prohibits government employees from endorsing religion, or prohibits religious icons on government property, or something of that nature. It says nothing about government money, nothing about government employees, and nothing about government property. Quite the opposite, in fact. The First Amendment says that everyone in the country may expresses themselves freely on religion and other topics. Thus, at least to me, it looks as if the First Amendment says the exact opposite of what censorship advocates want it to say. Two further things are of note. First, the First Amendment applies only to Congress, not to state and local governments. It says so explicitly. While judges these days prefer to interpret it as applying to all levels of government, it says directly that it applies only to Congress. Second, the Constitution’s framers had something definite in mind when they banned any “establishment of religion”. They were all familiar with the scenario in England, in which the Church of England was the established church. No historian doubts that this is what they had in mind when they thought of an establishment of religion. In England, basic rights, including the right to vote and hold office, were limited to members of the Church of England. The framers did not want any ‘Church of the USA’ holding similar power in our country. Some states had churches directly tied to the government, such as the Puritans in Masschusetts. Other state governments had ties to multiple churches. It was to preserve the rights of these states that the framers wrote the Establishment Clause. Modern-day censors are therefore using the clause to mean the exact opposite of what it was intended. This argument deals not with the letter of the law, but rather with general principle of non-discrimination. Government, in this theory, should not discriminate against members of any religion. Prayer banners and statues of Jesus do so. Hence those things have to go. Legal discrimination on the basis of religion is wrong. I fully agree. We should not have laws that make it legal for one religious group to murder and another not to, or require different amounts of tax from different groups. With aesthetic decisions, such as how to decorate war memorials or the walls of schools, that logic no longer applies. Any aesthetic decision is more pleasing to some people than to others. There can never be a guarantee that nobody will be offended, and trying to accomplish that will only lead to bland and ugly decorations. (Look at a corporate artwork if you don’t believe me.) On this issue, censorship proponents are prone to hyperbole about the effects of free speech and expression. One comment in the blog post I linked to above says that the prayer banner “treats non-Christians as second-class citizens”. In reality, it does not. The censors’ last excuse–and at this point we’re surely talking about excuses rather than reasons–is that we shouldn’t stand up for free expression in these cases because it doesn’t matter much. In the grand scheme of things, who really cares about a lousy war memorial or a prayer on a school wall? I find this to be a rather lame excuse. If the founding fathers felt that free expression deserved Constitutional protection, then we should feel so too. If we allow the government to chip away at our right to free expression bit by bit, soon it will be entirely gone. If we allow them to take away one basic right, soon we will lose others. We already have.